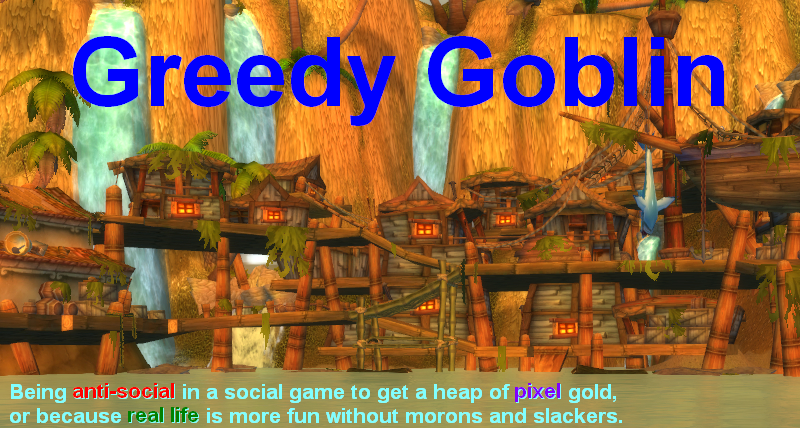 Greedy goblin: “Skill” PvP is consensual! Who is entitled to decide what is real “skill” PvP and what is just a gank? It seems everyone (including me) considers himself a judge. While the definition of “skill” is trivial, the ability to win a fight, the definition of the “fight” is absolutely not. Is a Catalyst vs Covetor engagement a fight? Is a remote seboed Tornado at 50 from a gate vs frig just jumped in is a fight? Is a super hotdrop vs lone carrier a fight? Is a frig piloted by a lost newbie vs an equally fit frig piloted by a seasoned lowsec dweller a fight? Who are you do decide? And who am I to decide? We need someone with authority to decide it once and for all. And I know who have all the knowledge to make the decision: the participants. Actually this is what everyone tells me: “go and try some lowsec PvP and see yourself”. The participants know their ship and their own abilities, therefore can completely assess if they have a chance to win or not. However the winner will surely claim it was a fight. If you just ask me if a miner gank is a “skill PvP” action, I can easily answer “yes, sure, it needs lot of planning and practice”. The miner would disagree. Which is the crucial point. He, knowing his own abilities and ship doesn’t see our fight winnable. He sees himself not as a defeated participant but a victim of a gank. The proper definition of the gank is a PvP engagement where one side doesn’t see hope to win, therefore wouldn’t engage if he had a choice. This is equally true to the Covetor miner, the guy who jumps into a gatecamp, the hotdropped ratting carrier and the newbie who somehow jumped to lowsec without having a clue about his modules. If you claim to be ganked, you are. If your opponent claims that you ganked him, you ganked him, period, your opinion doesn’t count here. If you disagree, then you have to accept me as real PvP-er, since all miners have the chance to fit tank to their barges, watch dscan, overheat hardeners or send out ECM drones. They didn’t because they couldn’t. They lack the game knowledge or they weren’t even at the keyboard. The above has an important consequence: to have a real, “skill” PvP fight, both participants must agree that they have a chance and willingly engage. Which means consensual PvP. Non-consensual PvP is necessarily a gank, where one side is forced to take a fight where he sees no chance of victory. If he’d seen chance, he wouldn’t need to be forced, he’d willingly engage. There are consensual fights in EVE. Alliance Tournament for example. Or timer fights in nullsec where both sides have time to prepare and spies to estimate their chances. Fights in PvP complexes of Faction Warfare. Red vs Blue. Duels. But most fights are not consensual. The very niche of EVE is not consensual PvP, aka gank. If you want “skill” fights and not ganks, why are you playing this game then? There are countless games where the opponent willingly engages and by doing so accepts you as an equal opponent. Oh, you'd say "by undocking, he consented to PvP?" So did the miner! My point is, and my last word in the “skill PvP” debate: if you are playing EVE Online, you are a ganker, who willingly moved away from “skill PvP” and went to the game of ganks. The moron of the day is this Mackinaw miner. Not for his 560M pod. Not for the deadspace tank that tanked nothing against Catalysts. Not even for the faction cap recharger when he was already cap stable. The real reason is the 3 high-meta ore mining upgrades on the ice Mack. Join our holy quest against dumbness, help the cleansing of highsec from untanked ships! Promise it is your last word? can we get on with why your position is so utterly wrong it makes most of us wonder whether or not you are carrying some form of debilitating brain injury? I'm sure some of your readers can come up with more examples. As a person who actually fight instead of just writing about it, I can tell you that agreeing to take fight has nothing to do with skill. For example if I take on a similar shop flown by some guy who might not be looking for a fight, but is able to, would you consider it a gank? That's just absurd. Unless you consider the act of unlocking in a combat ship a implied agreement to fight. Miners do not wish to fight and they are not in combat ships and are defenseless. Attacking them is ganking in its purest form. If you take the advice of more experienced players and start doing some real pvp, you will (hopefully) see the difference. I believe a CCP dev said it himself a few years back (I'm paraphrasing a bit here, cut me some slack) that "if at any time you are engaging in a fight not stacked in your favor, you are doing it wrong". The game IS all about ganks, but I'm sure people will argue that it takes skill to avoid ganks heading your way while setting up your own. Wow, do you really not have anything else to talk about and prefer to just keep talking the same point over an over. You are not a PvPer, you are a ganker. Ganking requires no skill, at all, which you admit. PvP requires you to know your ship(s), your enemies ship(s) and make on the spot decisions while actually risking something. You go in knowing that you are going to lost your ship which is why you take a disposable ship you don't care at all about. In its simplest form, PvP is where you put yourself at risk, against an opponent who is at least able to defend themselves. Your ganking is putting a cheap disposable ship on a cheap disposable alt up against an unarmed miner. Sure, if you are just sitting in a nado popping frigates on a gate, that's just as bad, but you are boiling all PvP down to it's simplest forms. Most of the PvP I see is fairly even, and both sides risk huge amounts of assets. This is all easily solved though. Why don't you actually TRY PvP? Go to lowsec, try to hold some moons or something, or go out hunting for a few months. Not paying people to let you gank their carriers, but actually go out and get into fights. The fact is you refuse to even find out what PvP is about, yet you still feel you are somehow able to tell everyone else that we are all wrong. The fact is though, you have no idea what you are talking about, so you are just coming across looking like an crying idiot. Honestly, until you go an get a clue about how to play EvE rather than your heavily blinkered view that seems to consist of reading a few E-Uni articles and guessing the rest, I think I'm going to have to boycott reading anything about PvP you post, since it's always the same thing. It's always an article trying to compare your effortless easy ganking with players who have actual skill in Pvp, desperately trying to put yourself on top, while you've never even looked at PvP. It's pretty pathetic, and I feel I'm being made dumber just from reading it. Your examples are consensual pvp. 2. roaming in underarmed gang and getting a hard fight: consensual fight. So basically you agree with Goblin? In both your examples the loser "wanted" to fight. We need someone with authority to decide it once and for all. No. We don't. Please rethink your casual authoritarianism. That said, your definition of ganking is good enough to work with. Still, you are trying to cram something into a boolean framework which is not actually two-stated. There are multiple aspects of gank. For example, some fights would be ganks according to your criteria if you asked the gankee in hindsight but not if you asked before the fight. The gankee did not know what the opponent had and thus engaged willingly. And then there are other situations (as Nony points out), where a gank attempt goes wrong. The fight is started nonconsensually but does not go the way the would-be ganker expected. In this case, if there was the option to avoid, the would-be gankee would have avoided in his ignorance, but not with highsight. And then there is the aspect of hunting a gank, which is attractive for many of us. One way to avoid gank is to tank, but this works only in highsec. In other areas, no tank is large enough. To avoid gank you must take other measures: being cloaked 99% of the time, running away proactively, and/or not being in space. This generally makes ganking outside of highsec much, much more difficult to do. And that difficulty is a challenge to the hunter. But by the same token, anyone who has spent more than a few hours outside of highsec has to know that there are predators out there looking for gank. The players are in dangerous space willingly. Even though they would be turn down all engagements if they could, if they actually could (i.e. there was a literal invulnerability field), their space would not pay and they would not be there. In any case, all of us who play EVE -- even "elite PVPer" (if any players exist who label themselves as such) -- play for more than one reason. One may be the awesome totally even fights decided only on the field by skill alone. But another is making a living in a dark, gritty universe where ganks happen, as well as many fights of varying degrees of retrospectively-viewed fairness. In short, stop thinking of gankers as botched attempts at "elite PVP", and start thinking of them as super-sophisticated AIs which create extremely challenging PVE. (I note that you are doing your part. Very public-spirited of you, Mr. Objectivist.) And stop thinking of PVPers as interested only in one thing. A person can be a PVPer and a ganker at the same time, in the same ship. He'll kill anything that he sees that he thinks he can beat. If that is a two-week newb that just blundered into lowsec, so be it. If it is a ratter in a belt that fires a cyno that brings a hotdrop, so be it. If it is by some chance a fair fight, so be that too. The issue I have with you posting the pictures of belts with just procurers and skiffs is that you, a known ganker, who I'm assuming has been ganking in the system, is appearing in local. I have all the gankers in my area marked. When there are any in the system I use a nicely tanked Procurer. When there are none, I use a untanked Mack. Try this. Leave the system. Come back in 4-5 days with an unknown alt. Then check the ice belt. I'm guessing you'll see a differnt collection of ships. "Most of the PvP I see is fairly even, and both sides risk huge amounts of assets." That's not been my experience. In FW it's usually cheap ship vs. cheap ship, or hugely expensive pirate ship vs. cheap ship. The one fleet I joined had 30 or so people roaming around for 2 hours basically shooting at nothing, since no one was daft enough to engage that many battle cruisers. 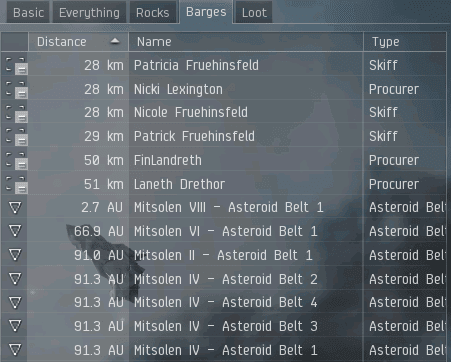 Most fights in Eve are not fair. The winner is usually decided by what they brought to the battlefield. There are the one or two exceptions, but that's what makes them memorable: they are exceptions. New Eden is not a fair place. It's not even a particularly nice one. This is why wormholers don't speak in local, and why null-sec miners dock up when anyone unknown drops into system. Assuming that PvP has some sense of honour and fairness to it, when the rest of the universe doesn't, is naive. The ting is though, cost or size of a ship isn't a definition of how powerful that ship is. A 50m isk ship can often destroy a billion isk+ ship. And its not a gank just because it's unfair. If I choose to go out fighting, even if I get blobbed, it's not a gank. It's not particularly skillful PvP on their side, but I was aiming to fight other people and that I did. The way I see it is this: A gank is when the player you are fighting has neither the intention nor the means to defend against you. PvP is any engagement between parties ready and able to fight back. Skilled PvP is the ability to succeed in a variety of situations where the odds are against you. That doesn't mean players who PvP never gank nor vice versa. But ganking requires no skills, so there is no comparison between a ganker and a skilled PvPer, no matter how much Gevlon wants to scream and stamp his feet. He's right on one thing, there's is no set definition. And some people perform activities that are very borderline. Gevlon doesn't. He ganks. He uses a disposable ship which means absolutely nothing to him to attack people that have no weapons. Even to a non EVE player, that notion is understood. I honestly can't believe that Gevlon does not understand this, which leads me to believe he is simply trying to justify why his KB stats should matter. Unfortunately to the majority of EVE players, it means nothing. I see the difference between you and the PVPers in the interpratation of what means "willingly engage". "The above has an important consequence: to have a real, “skill” PvP fight, both participants must agree that they have a chance and willingly engage. " Since he undocked with the ship in the nullsec, he is willingly agreeing to have a fight with any other ships." Therefore this is a PVP and not a gank, since he agreed to fight by going to nullsec. And also since he is willing to fight, he is prepared and therefore he has some skill. And vice versa, they interpret undocking in high sec as unwillingness to have an engagement to other players, therefore it is a gank. He is hiding behind concord, therefore he is a coward and not a "PVP worthy" target. just my 2cents as an impartial observer. No, really, all of you are poisoned by EVE and Gevlon is right. Skilled fights are consensual, ganks are not consensual. Let's take the failed gank: if you get ganked and win or live, it was still a gank. Sure, you might have won or lived due to skill (or more likely the lack of skill of your enemy), but it wasn't a fight you agreed to, and wasn't a skilled fight.